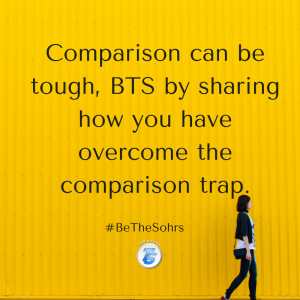 Today’s #BeTheSohrs focus is how you overcome the comparison trap. The one thing having choices does is eliminates the need to compare. When you have choices, you don’t need to compare what you have to what others have. Because of the database of churches and resources Sohrs.com has, you no longer have to worry with comparing your church to another’s. You can find the resources just right for you. While this might be true for Sohrs.com followers, it’s not true for the world around you. Others need to know how you overcome the comparison trap in general. Comparison can be tough, BTS (BeTheSohrs) today by sharing how you have overcome the comparison trap.